Kourtney Kardashian is still on vacation, and she's having the time of her life, if her Instagram feed is anything to go by. The 39-year-old Keeping Up with the Kardashians star is still in Portofino, Italy with her children. 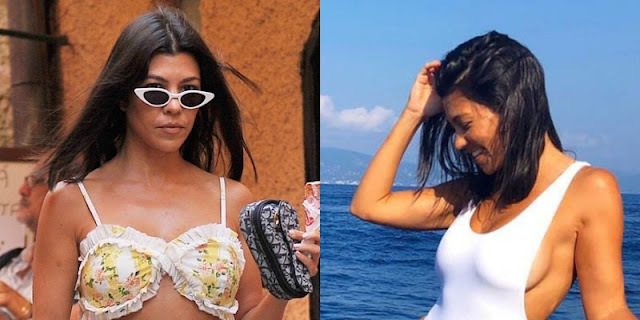 After wearing the tiniest bikini last weekend, which featured translucent PVC straps, and showed a lot of skin, Kourtney upped her game by donning not one, but two different swimsuit looks in one day. The reality TV star also took to Instagram to show a second beach look, this time wearing a skimpy, and somewhat see-through, white one-piece. The revealing swimsuit showed off Kourtney's incredible physique, and left nothing to the imagination.